An excellent effort from Novation - Launchpad will surely make Live complete for a good many users. Stunningly simple. Great build quality. Portable. Reasonably priced. Handy user modes. Stable operation. Ableton Live has been steadily gaining popularity over the last four or five years, going from an 'outside DAW' to the trendy software that everybody wants to say they use - no matter how much it actually figures in their productions and live work. During this time, there have been numerous controllers touted as being suitable for Live, but the best bespoke ones are almost always created in conjunction with the software developer, as Akai showed with its excellent APC40. Imagine our delight, then, when Novation's similarly collaborative Launchpad landed in our lap. So what are we looking at here, exactly? Launchpad is a USB-powered device that enables you to sidestep much of the on-screen mouse-work, and all without the rather imposing bulk of the APC40. Novation would have struggled to design something simpler than this 64-pad matrix, with additional rows of eight control buttons along the top and down the right side. There isn't even a power switch. The next thing you notice is the eminently simple but sturdy construction. You get the feeling that if you dropped the Launchpad, it might crack, but it would probably go on to give you years of reliable service anyway. The buttons also feel like they would easily withstand the kind of sustained bashing that we musicians love to dish out when we're 'in the groove'. Those buttons also have two pads in each corner with a small raised dot, so if you're unable to see the pads for whatever reason, you can still tell where your fingers are. Our only criticism about the build is the odd pad response, whereby it only takes a gentle press to generate a trigger signal, but you don't feel an under-finger 'click' until you press a bit harder. Novation say that this is for the purpose of durability, so only time will tell if it's worth it. After a simple installation, Launchpad couldn't be easier to use. It offers up two main Live modes, Session and Mixer, both of which are self-explanatory. In mixer mode, as well as soloing, muting and arming tracks, there are modes for setting pan, volume and send levels, with the backlit pads forming columns indicating the level, etc. "You get the feeling that if you dropped the Launchpad, it might crack, but it would probably go on to give you years of reliable service anyway." In reality, these functions probably won't see a lot of use for most people, as by the time you hit a few buttons to go through the display modes, it would be quicker to use a trackpad or mouse. What's more, the control isn't very fine when you get there anyway. Still, it's nice to have the option. Session mode is just as you'd expect, offering triggering of scenes and clips, and the same group navigation as the APC40, jumping through the session matrix in eight-by-eight chunks. The buttons light up to reflect slot contents: unlit for empty, amber for a loaded clip, green if it's playing and red if recording. There are also two freely assignable user modes. The first of these defaults to triggering Drum Racks in Live (although the pads send out a fixed velocity of 127), and under either user mode, buttons can be assigned to pretty much anything that responds to MIDI - we set them up so that we could bring up full transport controls and tempo nudge buttons, for example. Oh, and you get a special cut-down version of Ableton Live 8, too, although we suspect that anyone who's thinking of buying a Launchpad will already have their own copy of Live. So far, we've only looked at using Launchpad with Live. But Novation's acclaimed Automap software makes it very readily compatible with other software. We tried it with the latest version of Automap Standard and it all worked fine. Drum machines aside, though, not many bits of software are crying out for a matrix of 64 drum pads and 16 round buttons. More exciting is the prospect of using it with Automap Pro, to map QWERTY keyboard shortcuts to the pads. The prospects for integration with the forthcoming Max for Live are yet more thrilling. This promises to offer all manner of custom modules, like effects and sequencers, and as Launchpad is said to communicate fully (ie, in both directions) with it, programmers will be able to address all of the LED colours at varying brightnesses, and utilise all of the buttons except the four mode ones. 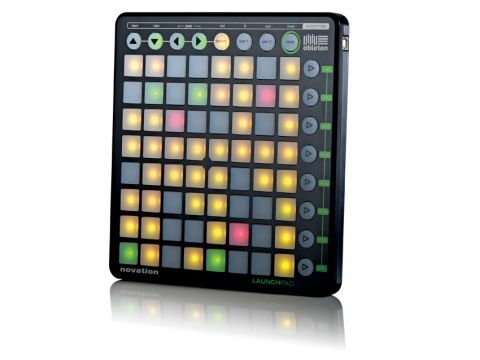 It sounds like an awful lot like Launchpad could become a monome for the mainstream. The APC40 might have a broader array of cleverly mapped controls, but we'd say that Launchpad is more of a blank canvas. While you can certainly customise the settings on an APC40, you probably won't, as they're all pre-labelled and it just feels a little bit like vandalism! So, it's time to take stock, and obviously the big question that we're getting to is this: should you buy an APC40 or a Launchpad? And, indeed, is there a case for getting both? "Akai's APC40 might have a broader array of cleverly mapped controls, but we'd say that Launchpad is more of a blank canvas." Well, Launchpad has a number of potential advantages over Akai's unit. Firstly, it's perfectly portable, with just about nothing to break, so while the APC40 really needs a flight-case for live work, Launchpad will slip almost unnoticed next to your laptop, without so much as a plastic bag for protection. Launchpad also sports another three rows of clips and scenes over the APC40. And by stripping away all of the channel faders and knobs, those who generally rely on external mixing and/or those who already have their controller of choice aren't paying extra for something they don't need. In terms of performance and integration, though, both are largely flawless, so we can't even slip a hair between the two in this respect. Ultimately, the APC40 is a more complete and complex proposition, and with its other editing features, it's a great compositional tool for the studio. Launchpad, on the other hand, is a lean, mean stress-reducing gigging machine. If the APC40 wasn't for you, Launchpad might well be, and with both units so perfectly suited to specific types of user, we can't imagine there being much competition between sensible consumers. In fact, there are compelling reasons for many to use both for different types of gigs (or even together - Launchpad works alongside the APC40, and with up to five other Launchpads). Suffice to say, we can't imagine that many Live users who take their show on the road who will regret buying a Launchpad. And at a thoroughly reasonable £150, this is surely a product that's about to take off in a big way.